This post is going to be a bit more rambling than usual. Bear with me. A couple weeks ago, I had lunch with a friend who serves as a trustee for one of our local community college districts. At some point, the talk turned to the impact business and entrepreneurship education could have on creating local jobs. While Silicon Valley appears to be recovering, like many areas around the country, it got hit pretty hard in the Great Recession; the "official" unemployment rate still hovers around 11-12%. As a former entrepreneur, whose current business provides services to early stage startups, and as a part-time teacher in marketing, this is an issue that I care about. One thing that motivates me is using what I know to improve the odds of success for the entrepreneurs I work with whether as clients or students. And as someone who adheres to a broad definition of entrepreneurship I'm a big believer in its power to create socioeconomic value. Of course, the connection between economic vitality, jobs, and startups is an article of faith bordering on dogma in Silicon Valley. Furthermore, I believe that education can be one critical ingredient in developing future entrepreneurs or at least improving their chances of success. Again, I'm not alone in this belief. Stanford University, UC-Berkeley, and virtually every other institution of higher education in the San Francisco Bay Area have programs in entrepreneurship and, in many cases, not just one but several. Thanks to Steve Blank and others, there is now a pretty good understanding of the difference between a scalable startup that leads to a large company and a startup that ends up as a small business. In Silicon Valley, the scalable startup is KING beloved by the entrepreneurial community, venture capitalists, and university entrepreneurship programs. Big impact! Big dreams! High risk, high reward! I mean, where else on the planet can you even have a semi-serious debate about whether a $20 million exit is a real startup or just a "dipsh--" company? (Dave McClure can carry that torch!) And a lifestyle business? What's that? Is that a real startup? Getting back to the conversation with my friend, as he was talking about what was going on at the community college level, this started me wondering. Is this benign neglect of small business startups (which I'll define here to include lifestyle businesses) smart? Where are the jobs being created? How durable our those jobs? Are the failure rates different for scalable startups versus small business startups? To answer the questions about the role of startups in job creation, let's start by examining an oft quoted statistic regarding small businesses and employment. While true, what's usually omitted is the last part, that these firms employ just 45.6% of the U.S. private sector workforce. 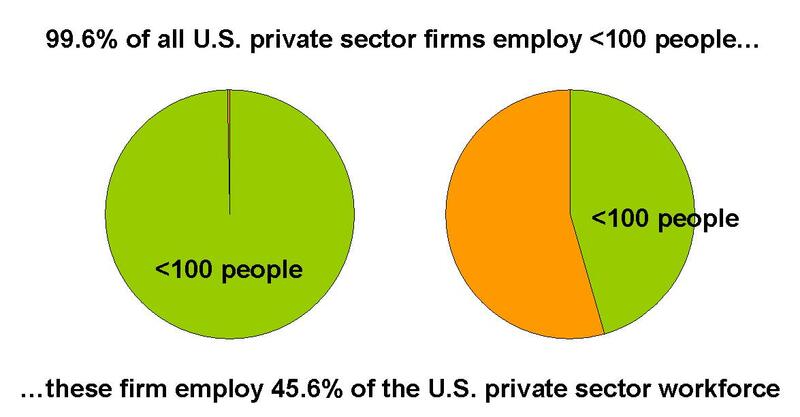 This means that the majority of U.S. private sector workers are still employed by large companies. So here's certainly one argument for promoting the scalable startup. But 45.6% is still a big number, so the point still stands that small businesses are an important source of jobs. With respect to new job creation by small businesses, the studies show that it's more about age than size. New companies, as one might expect, tend be small. Surprisingly, the jobs created appear quite durable. From 1980-2005, business startups (less than 5 years old) account for ~3% of U.S. private sector employment. While a small percentage, without these new jobs, the net employment growth rate for the U.S. would have been negative. New firms add ~3 million jobs in their first year; older companies lose 1 million jobs annually. While less than 50% of startups survive to their fifth year, 80% of the jobs created by the firms survive five years. So there appears to be statistical support for Silicon Valley's beliefs about startups, jobs, and economic vitality. And given the relatively safe assumption that most of these startups are not intended to be scalable (still looking for data to validate this) I would conclude that it might be smart to pay attention to these small business startups. Educating for Small Business Entrepreneurship? If small business startups are a meaningful element of job creation, then shouldn't we be offering small business entrepreneurs as high a quality an education as we do to those pursuing scalable startups? Which skills are common to both? Which are different? What would a small business entrepreneurship curriculum look like? Who is the small business entrepreneur? Are there different educational needs for an entrepreneur just starting out versus someone who's making a mid-career transition? U.S. startup formation from 1977-2005 has been relatively constant over time at ~500,000 reported per year. Entrepreneurial education appears to have little impact on the rate of formation but may have a role in reducing the rate of business failure. The "typical" high-tech founder comes from a middle class or upper-lower class background, is well-educated (>95% with a bachelors degree or higher), is married with children, had an early interest in starting a company but over six years industry experience before actually starting. This would indicate that in educating small business entrepreneurs, it's important to focus on training mid-career entrepreneurs business survival skills. This may also indicate that community colleges and evening continuing education programs are potentially better venues than a daytime, four-year university. Universities still appear to be a better fit with those seeking to build scalable startups (as represented by the high tech company demographics in the Kauffman study). Of course education and knowledge are merely one part of being a successful entrepreneur. Temperament is another big part. So are motivation, confidence, ability to recognize opportunity etc. Then there are external factors like access to capital. To the degree to which education can impact these, I'll be looking into these issues as well. Next week: I'm going to explore some of the similarities and differences between the skills needed by scalable vs. small business entrepreneurs. Matty, thanks for the link! I didn't realize this organization existed. Let me take a closer look and I'll be in touch.